Bought it for my daughter’s room. So pretty and soft. I highly recommend it! 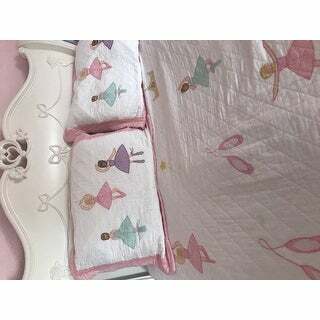 Bring charm and whimsy into your child's bedroom decor with this adorable ballet lessons quilt set. The quilt and matching shams are crafted from a light but comfortable, machine washable cotton blend fabric with an off-white background, pink trim, and an elegant diamond quilted pattern. Dancing ballerinas are embroidered across the design, making this sweet set perfect for blossoming dancers. My 3 year old daughter picked this out for her "big girl bed". I was a little hesitant because it is mostly white. It washes beautifully, the accent colors on the ballerinas are darker than shown in the picture which adds more brightness and contrast to the quilt. The quilt is well made and appears as though it will last a lot of washing. I am very glad I purchased this item, my daughter loves it, just wish more coordinating pieces were offered. I ordered this quilt set for my two year old daughter's room and it's adorable! The colors are true to the picture shown, and the stitching, embroidery and material is of high quality. This quilt will last through much use and many washes. I was disappointed to only receive one pillow sham when the set is advertised and priced as having two (that's why I rated it "good"). Also, it is a little hard to find other matching pieces to the set. However I did visit the manufacturer's website and was able to find the valance. What a beautiful quilt with so much detail!! I bought the quilt in size Queen along with two pillow shams for my 7 year old daughter. It was difficult to find a nice quilt for her in a size Queen that was not too adult for her. The price was fabulous and I would highly recommend the entire set. It is just the right weight and the scalloped edges give it a nice look. after looking and looking in stores for a ballerina quilt and only finding ones that were over my budget, I decided to look online. My daughter is 6 years old, so I let her decide which one she wanted. THis was reasonably priced in comparison to what I had been looking at at other stores. I bought it on a monday, it showed up on wednesday. She was very excited. We live in AZ so the nice light weight (but not flimsy) cotton fabric will be nice for her bed. All the ballerinas on the quilt have sort of a patchwork quality to them, with gingham fabric dresses and calico print yellow "hair". Each ballerina is a little different because of the fabric combination. Looks well made, haven't noticed any flaws in it to indicate that it was cheaply put together. But in any case, She is in LOVE with her quilt. I am not disappointed with my purchase at all. I hope they get these back in stock. I ordered for my 4-year old. However, they sent me a full set instead of a twin set. I will keep in anyway as it comes with the two shams, but obviously a bit big for a twin bed. Nonetheless, it hangs beautifully on the bed and can't beat the value! My 3 year old loves the dancing girls and thinks the quilt is beautiful. So from a kids prospective they love it! I would say the white is kind of dingy and the quilting in not really quilting. It is more like a blanket with loose thread to make it look like a quilt. This is not a plush quilt at all. You get what you pay for so for the price I am happy with it. Just don't have a plush thick quilt in mind if you order this set. The pink is very pink on the trim too. What a beautiful quality quilt! Amazing details, looks like it was hand stitched, very beautful! This quilt set is made with quality and is beautiful. I definitely recommend this product. I bought one set, and then when I saw it, bought another for my other child. I am very pleased with the Ballet Lessons quilt. It is very soft and well made. The colors are very accurately represented in the online photo. I purchased it for my 3 year old daughter's first big girl room and she loves it!! One comment is that the edges are lined in a soft pink gingham but the reverse side had gingham which is a little more of a hot pink. I wish they had kept the soft pink on the inside but no one is really going to see it. I wouldn't let that stop you from buying it. It is beautiful! This quilt was absolutely beautiful and worked out perfect in my little ones room. It has a pink gingham print on the edging (which I did not realize from the picture on the website) and on the reverse side of the quilt which was perfect with her gingham curtains she already had from potterybarn kids. The colors were so soft and do not overwhelm the room. It was difficult to find the matching pink for the sheet set so I went with white which worked out just fine. It was just as described. I love it. My daugthters room is so cute. Looks pretty and good quality as well . I bought this for my 5-year-old daughter, and she loves it! The colors are exactly as pictured online, and the quality of the material, stitching, etc is high. I would definitely recommend and think this was a great value for the price. Very beautiful quilt set for the price. Looks and fits wonderfully on the bed. It also washes and dries very well. Wonderful product for the price. Good quality but definitely over priced. This comforter is just absolutely gorgeous. I was surprised that each piece was actually applique, not simply printed. The ballerina's hands are a little bit weird as they all come to a point, rather than having an actual hand shape.... but still, overall, gorgeous and absolutely perfect for my daughter's new bedroom! "Where can I find the befskirt? I need two in twin size. " You may be interested in item# 21139011 or 19670163. "Are the quilt, and pillows handmade? And will the full/queen size fit on a full size mattress?" "could you please tell me if the pillow shams are with are quilted as well and the ones with Ballerinas on them?? thanks"
Yes, the pillow shams are quilted. "I have ordered the 3 piece bedding quilt set ballet lessons item # 11798461 but would like the curtains also do not find a link for them ? can you help ?" Hello lisa, we do apologize, we do not currently offer the curtains at this time. Thank you for shopping with us. "Does it come with quilt pillow case? Do you have curtain on sale or where can I find it?" Hello Lari0211, this set includes one quilt and two pillow shams (one in twin set). We do apologize, we are not currently in stock with additional items for this set. Thank you for shopping with us. We're redoing my granddaughter's room - and she loves to dance! "Somehow the pillowcases/shams were misplaced, is there anyway to buy them separately?" Hello alissasb, we do apologize, the pillowcase and shams are not currently offered separately. Thank you for shopping with us.